Managing a large and complex Salesforce org can be a daunting task. Salesforce change and release management challenges include moving metadata between multiple environments, unexpected Sandbox refreshes, different Salesforce account types, Salesforce API version skew, dealing with manual changes, and handling large numbers of metadata assets. 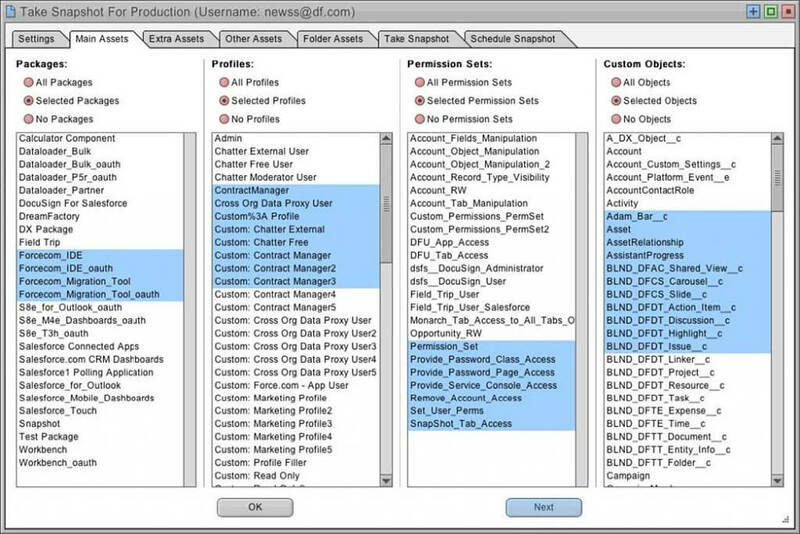 Native tools such as Change Sets, ANT, Force.com IDE, and the Setup Menu require lots of time and resources. Snapshot was designed to make the complex task of managing a large Salesforce org much easier. 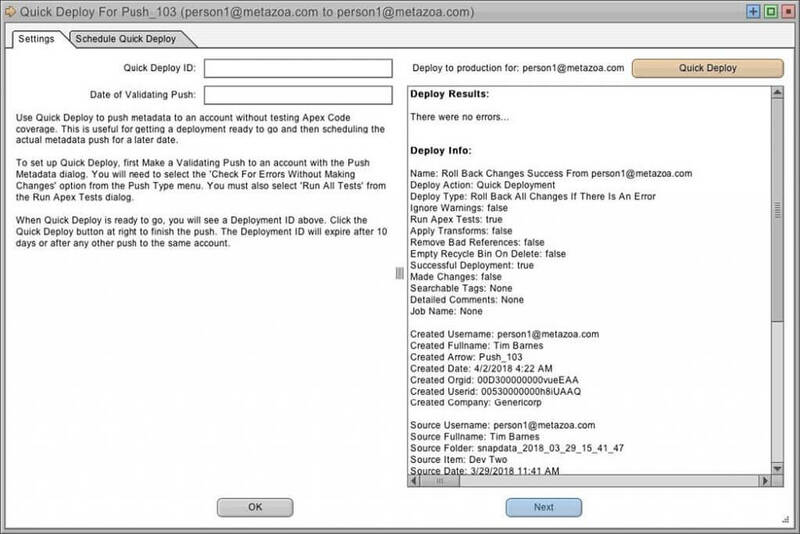 The engineering team at Metazoa has updated the product through 30 versions of the Metadata API. Many of Salesforce’s largest customers use Snapshot for change and release management. 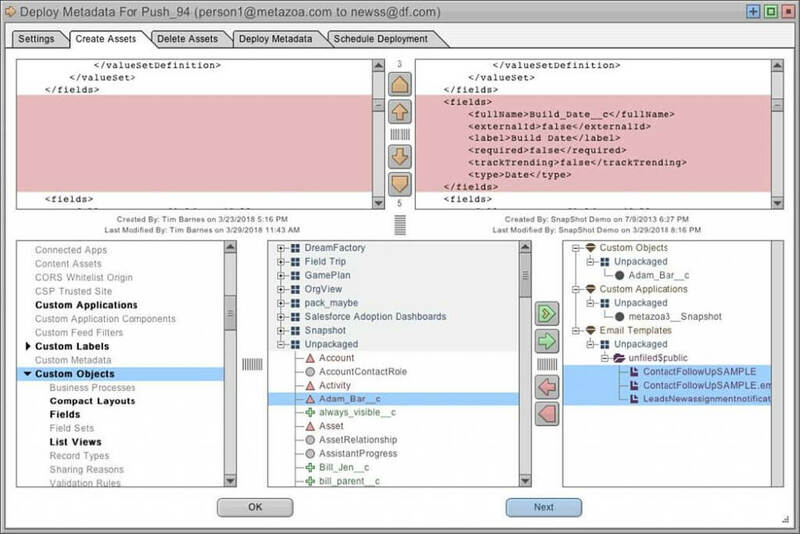 In 2018 Metazoa released a major upgrade to the product which embodies more than a decade of accumulated wisdom about how to simplify the task of change and release management for Salesforce administrators. 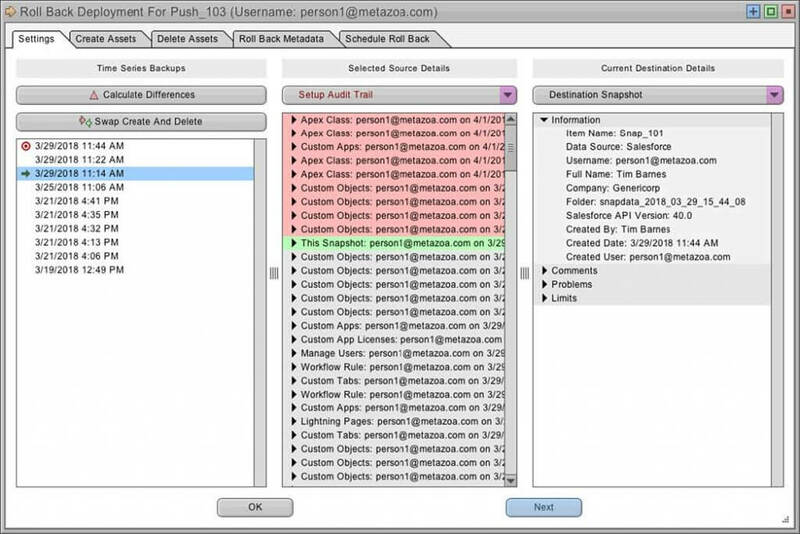 Snapshot provides highly visual tools for retrieving metadata from any Salesforce account or developer repository. 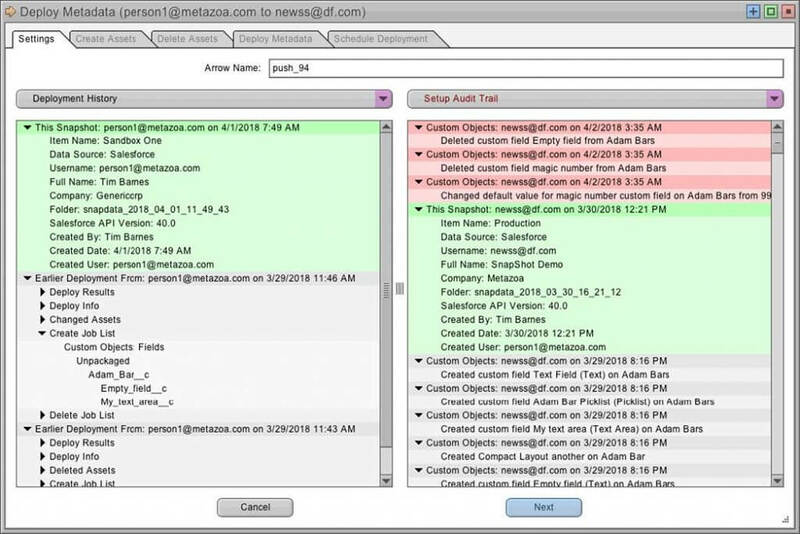 Metadata assets can be moved into a partial or full Sandbox, and after quality assurance and user acceptance testing, deployed into a production org. As part of the migration process, Snapshot provides two dozen security and compliance reports that help you analyze metadata structure, data usage, and account security. This white paper is a guide to the best practices for using Snapshot to conduct change and release management operations across a series of connected Salesforce accounts. The Take Snapshot dialog allows you to select the metadata assets that you want to work with. These assets can be used for reporting or migration to another org. Assets that are very numerous or very large are selected individually. These assets include: Packages, Profiles, Permission Sets, Roles, Groups, Queues, Custom Object Translations, Page Layouts, Apex Classes, Apex Pages, Dashboards, Reports, Email Templates, and Documents. All other metadata assets types are available in a “catch-all” list for quick selection. The assets that you select for the source snapshot will be available for migration to the destination. The assets that you select for the destination snapshot will be available for deletion. The destination assets are also important because they show the visual differences between the source and destination. There is a limit of 10,000 assets that can be downloaded in a single Metadata API transaction. For smaller orgs and Developer Sandboxes, you may be able to simply download all the Metadata. For larger orgs, you will need a strategy to decide which assets to download and work with. Try to select a superset of assets that cover your deployment needs without downloading more information than necessary. Perhaps you can discriminate on the basis of developer projects or Packages. This saves time and simplifies deployments and reporting. Profiles will be a problem for some deployments. The size of each Profile depends on what other Apex Classes, Apex Pages, Custom Applications, Custom Objects, Page Layouts, and Custom Tabs are included in the snapshot. In particular, Field Permissions can take up huge amounts of space. Imagine that you have 500 Profiles and 500 Objects each with 500 fields. In this example, the Metadata API would retrieve over a million Field Permission junctions. While this may be possible, gigantic Profiles are difficult to work with and take lots of time to retrieve and deploy. Try to cut down either the number of Profiles or Objects needed for the task at hand. The “Select Assets With File” interface on the Take Snapshot dialog can help load only the metadata Assets needed for a particular job. You can browse for any Job List or Package.xml file and automatically select those assets. Often a developer working on a project will send a file along to call out the assets that need to be migrated. The same Job List can be imported into the “Deploy Metadata” dialog to move the same assets later on. Each time you take a new snapshot, the old snapshot is not destroyed. In fact, all of the previous snapshots are maintained in a time series. You can use the Manage Time Series dialog to view all of the recorded snapshots through time. Any one of the older snapshots can be targeted for reporting or migration. Simply select the desired snapshot and click the Target button. The automatic storage of time series snapshots is a key feature for compliance. All of the differences across the time series can be viewed and reported on in the Compare Time Series tab. This provides an easy way to actively monitor any section of metadata for changes. If a change is detected, a comprehensive difference report can be mailed out to team members. This capability can be used to document progress on a specific development project or trigger an alert when metadata is changed for any reason. 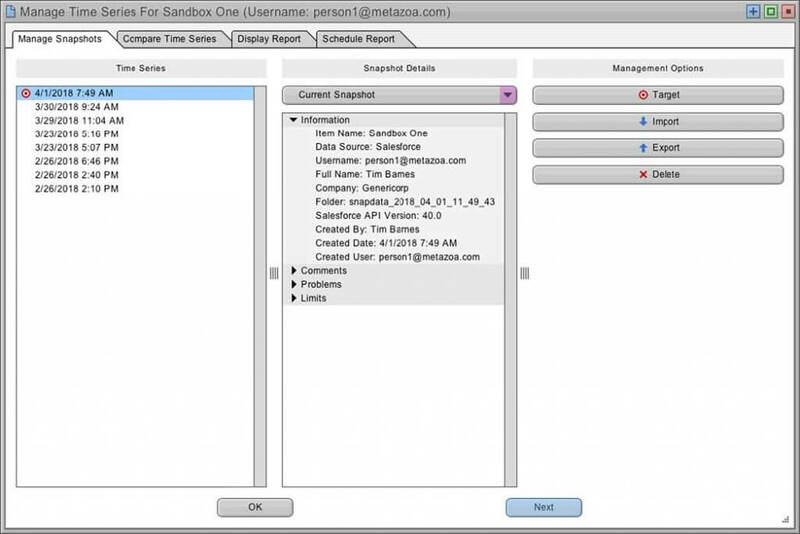 The Take Snapshot dialog can download metadata assets from any Salesforce org. But sometimes metadata assets reside in an online repository or a local file folder. A change and release manager might receive developer assets by email and save them into a folder. Or a developer could provide a link to an online repository with their latest project. The folder can contain a Salesforce DX project or a free-form collection of asset files. The Update Project dialog can handle all of these situations. The free-form asset folder is like a shoebox full of loose metadata asset files and other folders. The layout can be the same as the Force.com IDE, the Metadata API, or some other format. Snapshot will parse the file and folder structure and figure out how to harvest the metadata. A Salesforce DX project will also have a well-defined format that can be converted to a snapshot. The project folder can be located on the local machine or an online repository. You will need a command line interface to download the repository. Snapshot provides example command lines for Git and Subversion. The release manager can use the same command line interface that their developer uses to clone the project. The command line can be tested from the Update Project dialog. When you update a developer project, the files are downloaded from the repository (if any) and then harvested just like a regular snapshot. The developer project can be connected and pushed into a Salesforce org as well. One difference is that, because the developer project is not connected to an actual Salesforce account, some data usage and security reports are not available. Once you have a source and destination snapshot, you can double-click the deployment arrow to move metadata from the source to the destination org. The first screen you see will show you the state of the source and destination snapshot. This includes Setup Audit Trail and Deployment History information. If the source or destination snapshot is out of date, you can take another snapshot immediately from this interface. This capability guarantees that multiple team members working in an active org are not stepping on each other’s metadata, and also that the current snapshot being deployed and the destination snapshot being compared are up to date. Next, you will need to build Job Lists for the metadata assets that you want to create and delete. The Metadata API always deletes and then creates some assets in each transaction, so that is why the user interface is organized in this fashion. You can also just create or just delete assets if desired. The left-hand column shows all of the metadata types that are available. The disabled types were not captured by the current snapshot. The middle column shows the assets for the selected type that are available to be added to the Job List. The right-hand column shows the assets that have already been selected for the Job List. Notice that the middle column marks each asset with a grey circle, red triangle, or green plus icon. The assets marked with a grey circle are the same in the source and destination. The assets marked with a red triangle are different in the source and destination. The assets marked with a green plus are only available on the source and are missing from the destination. The slide-down panel at the top of the screen shows the line by line differences between the currently selected assets. The buttons in the lower right change based on what is selected. You can move an asset into the Job List, remove an asset, move all assets, or remove all assets. Other options include the ability to move only different or missing assets. Lastly, you can move assets and all related metadata types. This is useful for grabbing additional types that would otherwise cause the deployment to fail. The next tab lets you select assets for deletion. The Create Job List will contain assets gathered from the source snapshot, and the Delete Job List will have assets gathered from the destination. Either one of these Job Lists can be empty. After assembling the Job Lists, the Deploy Metadata tab can be used to push them into the destination org. After each deployment, you can go back to the previous tabs and further refine the Job Lists and continue with additional deployments. On the left-hand column, you can see the Create and Delete Job Lists. The Manage Job Lists button will allow you to import and export Job Lists, as well as browse for previous Job Lists that you or your team members have used while working on this org. 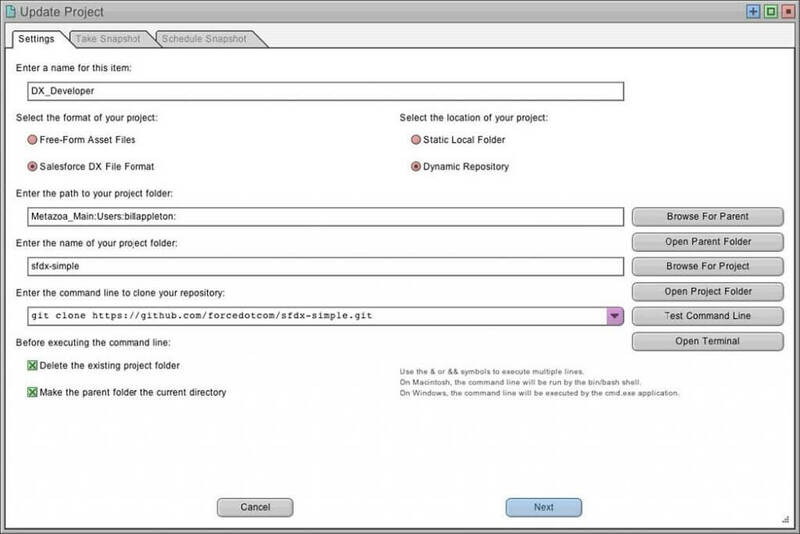 Sharing the Create and Delete Job Lists reduces errors and provides a simple way to orchestrate deployments. The middle column has powerful tools to help with deployment. The Run Apex Tests button allows you to select Apex tests that are run prior to deployment. This is useful for achieving 75% code coverage or setting up a Quick Deploy, discussed below. The Apply Transforms button allows you to transform data values before deployment. For example, you could remap a username from the source to the destination org to enable the successful migration of a Report or Workflow. The Job Names, Push Tags, and Deploy Comments can be any text string that you want to include for compliance purposes. These values and all of the other information about the migration are written out to the Deployment History custom objects after the push. These objects can also be used for creating reports in the Salesforce HTML interface. The Remove Bad References checkbox can prevent many problems from happening in a deployment. This option scans Profiles, Permission Sets, Page Layouts, and Custom Objects, and removes any references to assets that are not available in the destination org or included in the current Job List. Profiles and Permission Sets are scanned for Apex Classes, Apex Pages, Applications, Tabs, Objects, Fields, Layouts, and Record Types that are not available in the destination org or included in the current Job List. Page Layouts are scanned for Fields that are not available in Layout Sections and Related Lists. Custom Objects are scanned for Fields that are not available in Record Types and Compact Layouts. In each case, all the bad references are seamlessly removed before the metadata asset is deployed. Otherwise, the migration will surely fail. In some cases, like a production deployment, you may want a migration with any error to fail. In other cases, like updating a Sandbox, the option to Remove Bad References can save time and simplify the deployment. Lastly, the right-hand column has the Deploy Metadata button. Click this button to conduct a Validating, Transactional, or Partial Deployment. When the deployment finishes, there is a human-readable report displayed in the results box below. The results box will also contain information about any references that were removed. Validating Deployment – This option will check for errors without making changes. The deployment is simulated, and no changes are actually made to your Salesforce org. All success and error messages are displayed in the results box. Transactional Deployment — This option will roll back all changes if there is an error. If there are any errors, the entire deployment is rolled back; otherwise all assets will be migrated. All success and error messages are displayed in the results box. Partial Deployment — This option will change everything possible and ignore errors. Assets that cause errors are rolled back, but other assets continue to deploy unless there are cascading errors. This option is not available for production orgs. When you are deploying assets to a production org, you must use a Transactional Deployment. This option has the advantage of rolling back all changes if there is an error. Sometimes for more complex migrations, you will need to make multiple deployments. The order of operations for multiple deployments is discussed in the next section. We recommend that you push metadata assets in the following order when conducting multiple deployments. This order will minimize the errors generated by contingent dependencies and relationships in your org. Your mileage may vary, but this is a good starting point for a complex deployment. Carefully read any error messages and make adjustments as necessary. * This will push all Object fields plus the related settings including: Business Processes, Compact Layouts, Fields, Field Sets, List Views, Record Types, Sharing Reasons, Validation Rules, and Web Links. These settings can also be pushed individually if needed. ** Users tied to workflows must be created in the destination org prior to deployment. Select the Apply Transforms checkbox to automatically change usernames or other values prior to deployment. *** This will push all Profile metadata plus the related settings including: Apex Class Accesses, Apex Page Accesses, Application Visibility, Field Permissions, Layout Assignments, Object Permissions, Record Type Visibility, Tab Visibility, User Permissions, and Custom Permissions. These settings can also be pushed individually if needed. If you would like to automatically remove any references to assets that do not exist in the destination or in the Job List from the profiles, select the Remove Bad References checkbox before pushing. If you conduct a Validating Deployment that runs Unmanaged Tests for code coverage, then you can execute a Quick Deployment instead of the longer Transactional Deployment. A Quick Deployment enables you to schedule deployments to production with more confidence because you know the deployment will succeed and requires a shorter window of time. A Salesforce service update is also less likely to interrupt a Quick Deployment. The Roll Back Deployment dialog uses time series snapshot data to restore the destination org to an earlier date. Any one of the earlier snapshots can be selected as the source. The destination org can be refreshed and continually compared to the source until everything has been restored. The Calculate Differences button will calculate all of the differences in the source and destination org to assemble the Create and Delete Job List. In some situations, you will get better results with the Swap Create and Delete button. In that case, the time series of earlier Job Lists are merged and flipped. Often you will only need to restore some part of a deployment. This dialog documents all of the changes and the historical Job Lists in one interface. Snapshot provides tools to create a visual map of your Salesforce release environment. In the example below, there is a developer project and a Developer Edition org connected to a partial Sandbox, which in turn is connected to a production org. All of the snapshots and metadata deployments on the desktop can be scheduled and automated as needed. 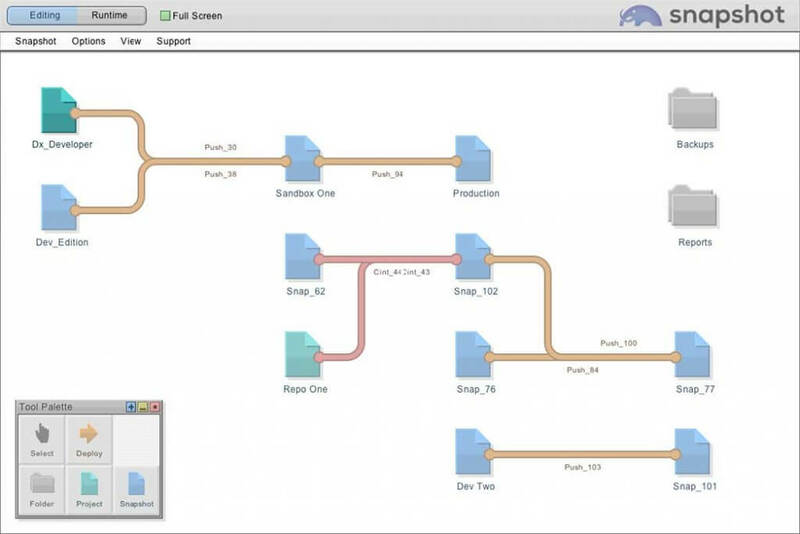 The Snapshot desktop provides a visual guide to metadata flows from the source to destination. Your implementation might be more or less detailed depending on your process and needs. The Snapshot desktop provides a flexible way to rewire your release environment over time and accommodate new projects and reports. This has discussed the challenges that companies face with change and release management on the Salesforce platform. 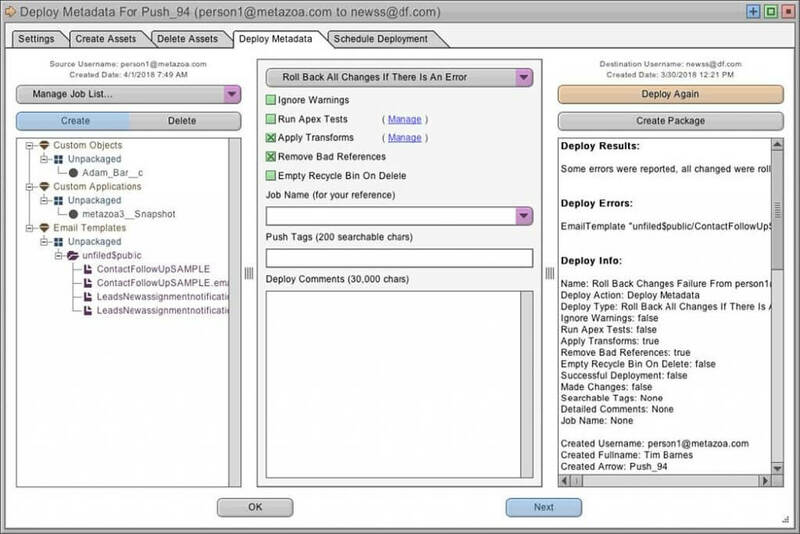 The Snapshot product from Metazoa provides a best-of-breed solution to enable effective release management through streamlined deployments, reporting, and compliance.